Cette maison d'hôtes totalement indépendante est située sur l'île Moser Back Cove à St. Margaret's Bay. Cette oasis immaculée et très privée est une maison d’invités avec une chambre, une salle de bain et vue sur l’eau depuis la cuisine, le salon et la salle à manger. Profitez de l'accès à notre quai pour la baignade et le kayak (kayaks et chaloupe fournis) ou détendez-vous et profitez d'un café du matin ou un verre de vin sur votre terrasse couverte tranquille entourée d'un beau jardin! L'espace de vie à concept ouvert comprend un salon lumineux et confortable avec une cuisine entièrement équipée et une laveuse et une sécheuse dans la suite. La chambre a un lit queen-size, un dressing et beaucoup de rangement. Une salle de bain complète avec douche. Les autres caractéristiques comprennent une télévision LCD 32 pouces avec câble et WIFI. La terrasse couverte s'ouvre à un barbecue et deux chaises Adirondack de cèdre. Profitez d'un feu de soirée dans la fosse située juste en face de votre terrasse couverte! Parking pratique à l'entrée principale. Toute cette propriété est un environnement sans fumée. En considération des clients ayant des sensibilités aux animaux, les animaux domestiques ne peuvent pas être logés. This home was so beautiful and had every single thing in it we could have needed. I have done VRBO before and had to bring things with us but not here. Our landlords were very friendly and helpful if and when we needed them. Our view was wonderful as was the location. The weather was meh! So we didn’t get to enjoy the patio like we wanted. I highly recommend. There was nothing that wasn’t absolutely perfect about our stay in Glen Margaret. The guest cottage was amazing. Everything you could need was there. The cottage was so charming and the view to the bay was the first thing we saw when we woke up each morning. We cooked in most evenings because we so enjoyed the cottage and the location and it was wonderful to come back to each day after exploring different areas on NS. Pat and Ed were wonderful hosts and couldn’t have been more welcoming. We used their kayaks or row boat every day to paddle around Moser Island. All of St Margaret’s Bay is incredibly beautiful and seeing it from the water is something we highly recommend. The waters were always calm and water temperature perfect for a swim. There is a wonderful rails to trails bike bath all over Nova Scotia and one access point is just down the road in Tantallon. Beautiful views along this path. We Also enjoyed the wonderful hiking trails and beaches along the southern coast. The only negative is that our week went by too fast and we were sad to leave his beautiful spot. We can’t wait to return! If you are looking for a quiet, clean place in a beautiful setting, then this place is for you. The house was spotless and the hosts were wonderful. It is the perfect place to sit and relax after a day of exploring. The landscaping on this property is amazing. It is obvious the owners take great pride in their home and yard, making this place picture perfect. This home is close to the rail trail, a beautiful maintained bike trail. The pics say it all, if not even understated! 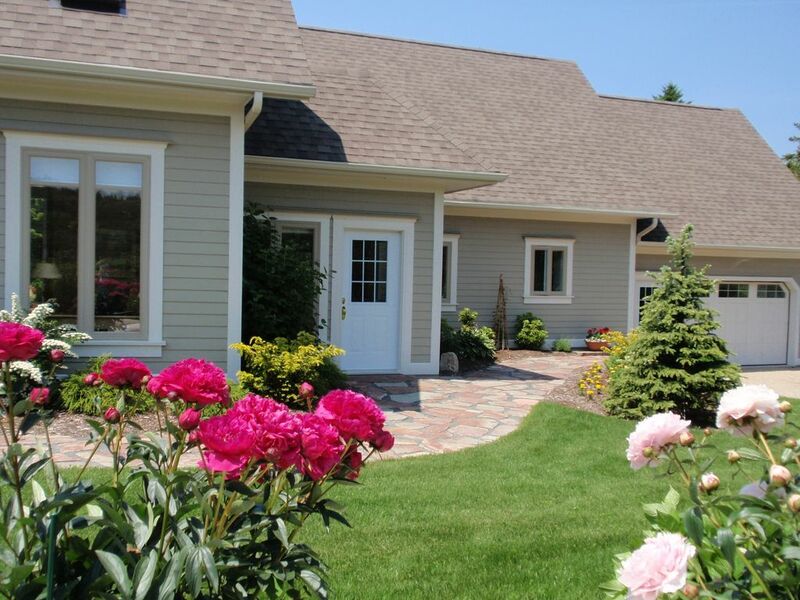 A wonderful place, immaculate, private...just perfect for our get-a-way to Nova Scotia. The location served as an excellent home base for visiting the south shore. Pat and Ed are wonderful hosts, peaceful, full of knowledge and true locals. We enjoyed our cool summer evenings winding down by the fire. The apartment was immaculately clean and was stocked with everything you could need if you want to prepare your own meals. It was also light and airy with A LOT of room for two people. The location was great and easy to find. A lot of privacy on the lot. We loved the Adirondack chairs overlooking the bay. Hosts were friendly. Didn't use the rowboat or kayaks but next time, we will. A lot to see and do within a close proximity to Glen Margaret. Everything you want and need are here! We stayed here in July for four nights. The unit itself is immaculately clean and well appointed. Our stay was during a heat wave, we were provided a fan and we were most comfortable. You can sit on the porch or eat breakfast from the nook and enjoy the ocean view. If you want to enjoy the ocean, two kayaks are available. A paddle around the island is a must. There is a rowboat if that is your preference. Conveniently located close to Peggy's Cove is a great plus. There are several restaurants in the area and it is a quick easy drive to Halifax and nearby grocery stores. It is a beautiful drive in both directions. Our review would be incomplete if we did not mention the owners, Pat and Ed. The two of them are the nicest, friendliest, most helpful owners we have encountered. They make the stay even more special. This was an experience we will treasure. If you want a completely satisfying stay, book this unit. Peggy's Cove à 10 minutes en voiture.